Then there's this complaint about gluten-fakers written by a waitress. Some people say they have an allergy, but they just feel better when they avoid eating gluten. They don't get sick enough when around gluten to be considered actually allergic. Where's the line? What counts as sick enough? I sometimes say I'm allergic to cigarettes. After smoking most my life, then quitting cold turkey when I was first pregnant, I now find that a mere whiff of smoke is enough to give me a headache. If I ate dinner on a patio near a smoker, I'd go home and actually throw up. It took a while to make the connection to how I was feeling and a nearby smoker, but now it's a crystal clear cause and effect. Yet I don't break out in hives immediately, nor do I suffer for days. I just barf out the toxins and I'm good to go. I don't know that it's an allergy, but suffice it to say that being around smokers makes me physically ill. And the thing is, sometimes if you say it makes you sick, people do it anyway. Even some good friends roll their eyes at moving tables when someone lights up because I'm "picky" about things like that. But if you say it's an allergy, people will respect that without question. Well, without questioning it to your face. So using the term is effective even when it's not entirely accurate. 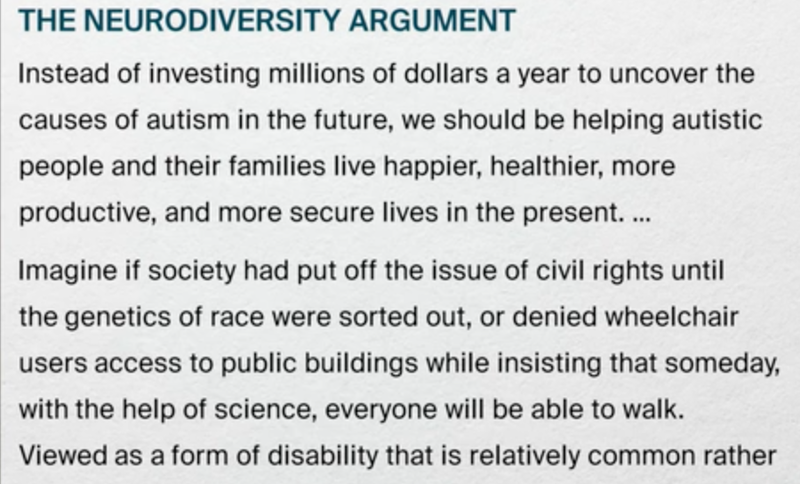 "The Agenda" on TVO just aired an excellent piece on Neurodevelopmental Disorders that says our entire model of ADHD, Autism, Alzheimers, and other spectrum conditions, is entirely wrong. I mixed allergies in here too, because it feels like a similar argument, but it wasn't discussed on the show. Dr. Tom Mikkelsen, from the Ontario Brain Institute (who knew that existed?! ), explains that diagnostic labelling is just not meaningful. They're looking at patterns of gene disorders that drive specific flavours of conditions, and the shift now is to "resolve complex groups of disorders into many more discrete disorders." He uses Alzheimers as an example because the actual condition is very rare, but it's used as a label for many different conditions that include memory loss. Those conditions should be labelled differently. It appears the pendulum is shifting in the other direction towards getting rid of spectrums in favour of pinpointing many more specific gene disorders. To clarify, I don't mean to say they're going to find more cases, but that the current cases will be diagnosed much more specifically. This can lead to significantly more specifically targeted therapies. Instead of labelling a group of conditions based on a checklist, as has been the practice for some time, now they'll find the mutated gene or group of genes causing the specific issue and be able to send you down a clearer path towards a solution OR let you know that this particular gene grouping is trickier to solve. It reminds me of an interview with the late Dr. Robert Buckman who said that we have to stop using the term "cancer" generally because there are so many different types. Having cancer could mean needing a mole removed or it could mean you've got a week to live. It's like using the term "infection" generally whether we're talking about a pimple or AIDS. The generalized terms muddy the waters in an unhelpful way. I wrote more about that a couple years ago with respect to anxiety. "many conventional diagnostic labels may be misleading, and fail to capture the true picture of a child’s problems, according to new work by a team at the MRC Cognition and Brain Sciences Unit at the University of Cambridge, which has come up with a radical, alternative approach. Duncan Astle and his colleagues studied 520 children aged between 5 and 18 years (average age 9) who had been referred to a research clinic at the unit for problems with attention, memory, language or poor school progress in reading or maths. Setting aside these diagnoses, they gave all the children a battery of assessments of their cognitive and learning performance. . . . the children fell into four distinct groups. But these bore no relationship to their previous diagnoses. As the researchers write, “children referred primarily for problems with attention, poor learning or memory were equally likely to be assigned to each group”. This finding is worth stressing. The conventional diagnostic labels already given to the children did not reflect their cognitive profiles identified by the thorough testing in this study." Here's a summary of what I heard from them collectively: The panel agreed that the issue can be polarizing, but it's not an either/or situation, it's both/and. We can look at prevention, treatment that includes supports to remove barriers for people, and the ability to maximize people's potential all at once. Prevention doesn't mean that people with atypical neurology aren't valuable as they are, but that being atypical definitely makes some things harder in life. The suffering of people with special needs can be ignored if we only think of them as different rather than having a neurological disorder. Of course this world needs a variety of people, but it's important to acknowledge that it's more work for some people to manage some aspects of life that others never have to think about. We need to respect the extra work people have to go through just to be part of a conversation. 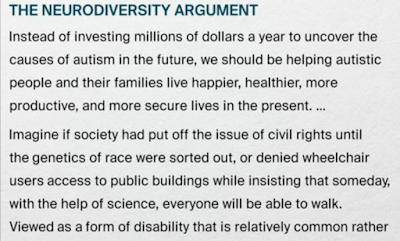 People in the neurodiverse population are not to be pitied or glorified, and school boards, the government, and workplaces must put in the work and funds so they can reach their full potential. And, of course, we'll need more professionals to do this level of testing. Education and health sectors are both built around the current labels, so it will be tricky to make this transition, and these researchers are not quite ready to lead them yet. We know the labels don't work, but they're not yet totally clear what will replace them. We don't want to replace one bad construct with another. It was in my lifetime that people with challenges were tucked away. Non-verbal when it was time to sign me up for kindergarten, my mom talked to me about maybe taking the short bus that picked up a neighbour with Down's Syndrome a couple years older than I was, instead of going to the school my siblings went to. My ability to read, write, and do math, despite my inability to talk, kept me out of the "special" system back in the 60s. This is another huge step towards better understanding of a whole host of issues. ETA: A paper arguing that psychological classifications are inherently fallacious; it's explained further here if you don't want to pay for it or bother emailing the authors for a copy. And there's this article critiquing psychiatric disorder criteria, and this one on the boundary between biological fact and social value.